Narrator: Welcome to Wonders in The Word. A radio ministry of amazing facts. For thousands of years, millions of people have found hope, truth, comfort, and new life in this book of books called the Bible. Experience the power of these sacred pages today as we join international evangelist and president of Amazing Facts, Doug Batchelor as he highlights Wonders In the Word. Narrator: In today's presentation, Pastor Doug shares some facts that you might not have known about hell in a message titled, The Lake Of Fire. Pastor Doug Batchelor: Now, when we think of fire and brimstone, what Bible subject pops into your mind? Pastor Doug: Hell, and that's our subject today. Hellfire which is exactly the same as the lake of fire that you find in Revelations. Some have tried to separate the two. It's the same subject that we're going to study. The Bible has a lot to say not only about the reward of heaven and we have a study coming on The New Jerusalem. You're going to love that one but we also have a study on something that is in Revelation, it is in prophecy, old and new testament, dealing with the punishment of the wicked. It's a sobering truth we need to be aware of and God wants us to know to avoid it but he also wants us to know the way he is dealing with sinners is a loving way. The love of God is revealed in this subject. Let's get right into our study. How many lost souls are being punished in hell today according to the Bible? Answer, 2 Peter 2:9, "The Lord knows how to deliver the godly out of temptation." Godly are delivered, "And to reserve the unjust unto the day of judgment to be punished." Where are the unjust? Reserved. Any of you ever made a reservation? It's something that is held for you. You don't want this reservation but the unjust they're being reserved. They're being held for this day of punishment. Again, John 12:48, "The Word that I have spoken," Jesus said, "Will judge them in the last day." We read a lot about that in John 6 today When are they going to be punished, rewarded, judged? The last day. How many people are burning in hell now? Nobody. Some of you are getting riled up. You say, "Pastor Doug you telling me you don't believe in hellfire?" I do believe in hellfire if that makes you happy. I do. Pastor Doug: I believe the wicked are going to burn. For our Baptist friends out there I think you wanted to hear that. My dad was a Baptist. First time I was baptized in the mountains, remember that subject, Baptists? Pastor Doug: I understand, and this is a very integral part, I do believe in it but nobody is burning yet, according to the Bible. Because the Lord says they are reserved, haven't been judged yet, resurrection hasn't taken place. Even the resurrection of damnation hasn't taken place yet. When will sinners, according to the bible, be cast into hellfire? How many of you remember the parable Jesus told about the farmer who had an enemy that spread weeds, tares in his wheat and in that parable they're told to first gather together the tares, bind them in bundles and burn them. Matthew 13:40 is where you find this. Then later when Jesus explains this parable, he says in Matthew 13:40-42, "So shall it be in the end of the world," When? Pastor Doug: "The end of the world the son of man will send forth his Angels and they will gather together them that do iniquity and shall cast them into a furnace of fire." They're being cast into a hellfire, lake of fire, furnace of fire, you can call it what you want. When? The end of the world is when they're going to be gathered and punishment is meted out. How many are burning in hell now? Nobody is burning in hell now. Where are sinners who have died now if they're not burning? Lot of scripture. Bible tells us John 5:28-29, "The hour's coming in which all that are in the graves will hear His voice." It's coming, "And they'll come forth." The wicked is reserved, Job 21:30, "The wicked is reserved unto the day of destruction." He's being reserved just like Peter said. And again, "Yet he shall be brought to the grave, he'll remain in the tomb." Until when? The day of judgment. He's reserved in the tomb until the day of judgment. If that's clear please say Amen. Pastor Doug: What is the end result of sin? The Bible tells us penalty for sin is death. James 1:15 bears that out, "Sin, when it is finished, brings forth what?" How many know this one, John 3:16? Could you say this by heart? "For God so loves the world, He gave his only begotten son that whosoever believeth in him should not perish but have everlasting life." Now, this is something that some people they have an aha experience right about now. There are two destinies for everybody, there's two roads, there's two choices, there's two masters. Life and death. Good and evil. Christ and the devil. Either eternal life or perish. It is not eternal life and heaven, and eternal life and the fire. Life and death is what he's offering us. Are the wicked punished in hellfire? Yes. How long? Well, we'll get to that in just a minute. Again, Romans chapter 6, what does Paul tell us, "The wages of sin is what?" Everlasting life in the fire? Is that what it says? The wages of sin are death but the gift of God is everlasting life. The gift doesn't go to everybody. It's those who have everlasting life is for everybody. The first lie that the devil told Eve was what? "You won't really die. You'll live forever in hell or you'll live forever in heaven but you're immortal." We looked for all the verses this morning dealing with immortality did we find one? I asked the whole audience. No offers. Is there a single verse in the Bible that says we have immortality now? Not one. God said that you will die, the devil said no you won't, the tragedy is that they're many Christian leaders that are repeating the lie of the devil. If the idea that the penalty for sin is everlasting torment. Did Jesus die on the cross for our sins? If the penalty for sin is to burn forever and ever and ever and ever, Jesus didn't pay our penalty. The penalty for sin is death. Did he die? Pastor Doug: He paid our penalty. The whole idea that the penalty for sin is eternal torment, Jesus did not take our penalty, and then we're all in trouble, but He did die. It's like with Daniel, the penalty for disobeying the king's command was death, he put him in the lion's den, he spent one night, he took him out, he said, "I've kept the law. The law has been satisfied." Then he threw in Daniel's enemies and the lions ate them. Daniel came back out alive. He didn't stay in forever. What will happen to the wicked in hellfire? The Bible tells us in Psalms 37:10 and 20, "For yet a little while and the wicked shall not be but the wicked shall perish into smoke they will consume away." They're going to burn up. Malachi 4 you know this, verse 1, "For behold the day comes that will burn as an oven and all that do wickedly shall be stubble." How many of you here have done farming before? You know what stubble is? After you harvest the rice they've got this little stalks that looks like it's been mowed off. It's called stubble and you burn it. It just smolders and that all that's left. It'll be stubble, it'll leave them neither root nor branch, Malachi 4, "The day that comes will burn them." Say this with me, it's talking about the wicked, "The day that comes will burn them up." What does it say, they're going to be burned up, it's all gone. You got to raise your voice when you say that. Pastor Doug: At the foot of Mt. Vesuvius, it used to be much taller of course so did Mt. St. Helens, there was this Roman Las Vegas. It was a very lush seaport town for people to vacation and the towns of Pompeii and Herculaneum were devastated during an earthquake in about 68 BC but the mountain finally blew its lid in 78 BC. What many people don't know, and of course at least 2000 bodies they found so far, they haven't finished excavating it yet, but some people were found. Gladiators still chained up and a lot of Roman soldiers lost their lives during that time. Little amazing fact a lot of people don't know, the legion of soldiers that worked under the General Titus, who later became the emperor, that destroyed Jerusalem and sacked the temple in 70 AD were at that time vacationing as a reward for their service. Doug Batchelor: cast him into a furnace of fire." Again, Revelation 20:9 it says, "They went up on a breadth of the earth." This is something we'll talk more about tomorrow night when we study the millennium of Revelation 20, The Devil Being Chained. "They went up to the breadth of the earth and compassed the camp of the saints about the beloved city and fire came down from God out of heaven and devoured them." Doesn't that sound a little bit like what we read about Sodom and Gomorrah? Do you know the Bible writers tell us what happened to Sodom and Gomorrah is an example of what's going to happen in the last days and how God is going to deal with the wicked? It goes on again? Proverbs 11:31, "The righteous shall be recompensed in the earth." Remember when Jesus said the meek will inherit what? Doug Batchelor: The way it is now or the earth made new? I'll create a new heaven and a new earth. The righteous are going to be recompensed in the earth. Much more the wicked and the sinner. I don't know if you caught this. We just read three scriptures here that told about hellfire. Where is hell going to burn? On earth. More specifically, Washington, DC. Doug Batchelor: The idea comes from Greek mythology again. Hades lived in the underworld. This idea that the devil is down yonder. I remember walking out of the market one day. Sometimes I just look for an excuse to go to the market so I can read as much of those tabloid covers as possible for entertainment. I remember checking out of the market one day, and it said, "Oil well drillers in Russia drilled too deep. Demons escape from hell." Doug Batchelor: Any of you remember that one? [laughs] There are preachers that still preach. Way down yonder somewhere, the devil's got his condo. There's his whole office, and he's got everything set up down there in these caverns. In the book of Job 1, "When the devil came to the Lord and the Lord said, where'd you come from?" He didn't say I came from a cavern down in hell in the earth. I came from walking to it for on, on the earth. The devil's business isn't down yonder, it's up here. He's on the earth. That hellfire is going to rain down on the earth. God rains it down on the earth. On the earth they compassed the camp of the saints, right? That's the way it's going to happen. How big and how hot will hellfire be? The Bible tells us the day of the Lord will come as a thief in the night in which the heavens will pass away with a great noise and the elements will melt with fervent heat. Some think that when the Lord comes as a thief, life's going to go on for another seven years. This whole left behind secret rapture scenario. They've got the Lord coming like a thief and then life goes on for another seven years. What does the bible say is going to happen after the Lord comes like a thief? The elements are going to melt with the fervent heat. They learned when the atomic bomb dropped on Nagasaki and Hiroshima, that even rocks will burn. You get them hot enough. 2 Peter 3, "The earth also and the works therein will be burned up." It's going to be burned up. There'll be nothing left of the wicked. God's going to purify. Fire purifies. How long will the wicked suffer in the fire? Some people think they're going to burn forever and ever. Jesus said, Revelation 22:12, "And behold, I come quickly and my reward is with me to give to every man according as his work shall be." First thing, when do they get rewarded? When He comes. How do they get rewarded? According to what they deserve. Does everybody get the same reward? If everybody burns forever and ever, then it's really not fair that Cain who killed one person, his brother, 5,000 years ago would burn 5,000 years longer than Adolf Hitler. I'm assuming Hitler's lost. Is that okay with you? Doug Batchelor: I don't want to judge him or anything. Then someone's going to come up to me and-- Would that be fair? Of course not. Everyone's going to get rewarded according what his work shall be. Again, Mathew 16:27 it says, "And He'll reward every man according to His-" what? His works. "We're saved by grace but we're rewarded according to our works." Your works will demonstrate whether or not you really are saved. That's why Jesus said, "Why do you say Lord, Lord and do not the things I say?" Luke 12:47 and 48, "That servant that knew his Lord's will and neither did according to his will, shall be beaten with many stripes." In other words, if we know what God wants and we don't do it, were punished more severely. "He that didn't know his Lord's will and didn't perform it, he will be beaten with few stripes." Does that sound fair to you? That's what Jesus said. People are going to get according to what they deserve. Christ said, "Fear not them that kill the body but are not able to kill the soul." Some people say, "Well, the souls burn forever in hell. The body gets burned up." Have you heard that before? Yes, it's true Doug. The body's all get burned up and God makes a new heaven and new earth but the souls burn forever. What did we learn about the souls today? Soul that sins will die. What does Jesus say about what happens to the soul in hell? "Fear not them that kill the body but are not able to kill the soul." He goes on and says, "Fear them that destroys soul and body in hell." Will the fire ever go out? The Bible says Psalm 37:10, "For yet a little while, and the wicked shall not be but the wicked shall perish and the enemies of the Lord shall be consumed. Into smoke, they will consume away." Again Isaiah 47:14, "Behold the day shall be as stubble. The fire shall burn them. They shall not deliver themselves from the power of the flame." These are prophecies and this is a prophecy code meeting. There'll not be a coal to warm at nor a fire to sit before." No coal, no fire, they're going out, right? If you have any doubts, Jude tells us, "Even as Sodom and Gomorrah are set forth as an example suffering the vengeance-" of what kind of fire? Eternal fire. Some people say, "There you have it Doug, the fire's eternal. It's going to burn forever and ever. Is that what it said? Are Sodom and Gomorrah still burning today? They were burnt with eternal fire but they were burned up. What it's saying, was Sodom and Gomorrah ever re-built? It's 4,000 years ago. You can go there today, it's still ashes. They were burnt with eternal fire. The results of the fire are eternal. It doesn't mean that they are still burning. They were cities, not people. The idea that God's going to burn cities forever and ever is even more absurd. People seize upon a few misunderstood phrases and they build a whole theology on that. They blind themselves to the bulk of evidence and they focus in on what they want to believe. There are a few difficult scriptures where it uses the word forever. The word that's used there in Greek is eon. Have you ever heard someone say, "Oh I haven't seen them in eons"? Eon is an unspecified period of time. It doesn't have a start or a finish per se. The reason God uses that word is because all the sinners burn different periods based on what they deserve. He couldn't give a specified period. There are other places in the Bible where you're going to find the word forever, and it obviously had an ending. Do you remember for instance when Jonah? Jonah's time in the fish was compared to the hell that Jesus went through. Jesus quote is Mathew 12 it says, "Jonah had prayed from the belly of the great fish." and He said, "The earth with her bars was about me forever." He was in prison, how long? Do you think it felt like forever? What Jonah went through was a good picture of the darkness and separation from God. Here he is in the bowels of the sea monster at the bottom of the ocean, and it's dark. One day it occurred to me that if he was in there alive, maybe that fish had swallowed other things that were still squirming in there with him. Wouldn't that be awful? Then if you ever do any diving at night, sometimes these fish flash by luminescence and also a little flash octopus and a jellyfish. It must have been like hell in there, right? This is how we talk and do you think it felt like forever? Three days and three nights in the digestive system of a sea monster. Was it forever? The Bible says he was in the belly of the fish three days and three nights. Again, you can read in Exodus 21, a Hebrew could have a servant for seven years. After that time, you could go through a ritual where he would stay with his master. It says, he will serve him forever. How long will that be? Until he dies, right? When Hannah brought little Samuel to the temple. She said, "I'm going to leave him here forever." How long was that? Until he died, the rest of his life. Again, it specifies later for as long as he lives. When it says that the wicked are going to be burned forever, it means- the word there don't forget, is going from Greek to English, it's eon. They're burned up according to what they deserve until they die. They're punished. They're burned with not only everlasting fire. Will they ever live again? No second chances. It's also called unquenchable fire. I'll get to that in just a minute. Forever and ever is a Biblical expression which means, until the end of the age. Not necessarily an infinite, unending length of time. Doug Batchelor: who is a great scholar, he also believes that the Bible is very clear that the wicked will be burnt up in the lake of fire. 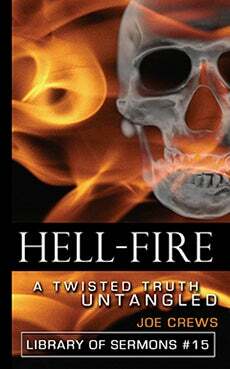 Pentecostal Edward Fudge wrote a book that surprised everybody and he said if you're going to go by the Bible there's no question the wicked are burnt up in the lake of fire. There's a lot of people out there that know this and they're afraid to say anything because it's considered unpopular. Quick story must be 25-30 years ago. I was driving my little Mazda GLC Japanese car across Texas to the home where we were living at the time and I saw, Christmas Eve, car was broken down and I pulled over to see if they needed any help and the man said I'm not sure what it is, lights just started getting dim and finally the car died and I used to do mechanic work and as it sounds like your alternator and we checked battery was stone dead. Alternator wasn't putting anything out so something very funny he's driving this big old Texas Oldsmobile or something like that. I pulled his car several miles to our house with my Mazda GLC. It was Christmas Eve couldn't get-- I took his alternator apart it needed new brushes you men know what I'm talking about and couldn't do anything about it that night invited him, his wife, two girls to stay the night with our family and got to talking and he's a Baptist minister. I wanted to study. We started talking about some of the differences of what we believe and this subject came up. As I shared with him what I've just shared with you he became very nervous and looking a little edgy. He said brother Doug, he said I've seen these scriptures before and I realize if you're going to go strictly by the Bible that it is pretty clear that hell doesn't burn forever but then he said if I told my church members that they won't come to church anymore. I said,"Brother is that why they're coming? Fire insurance, trying to stay out of hell?" And granted the bible does have some very sobering warnings about the lake of fire and wanting to avoid it that may be a starting point for anyone in the right mind right? I mean fear of destruction we all-- That's why we don't grab rattlesnakes, it's self-preservation. It might be a starting point but somewhere along the way if the only reason you're going to church and serving God is you're trying to stay out of hell, should you ever arrive in heaven. You've lost your motivation. Along the way we've got to learn to do it because we love the Lord and we know him and the other reason this subjects important to me. Before I learned the truth I hated God. I wouldn't say that out loud but in my heart of hearts, I thought God is mean he's going to torture these creatures who are all feeble and weak sinners and he's going to torture them through endless ages for the sins of this brief lifetime. Why he's a sadist, it's what I thought. When I learned the Bible truth on this subject it was one of the most liberating subjects I had ever studied because it helped me see that God is just and he's loving, he wants us to have life everlasting, he wants it so much that he was willing to die to provide the opportunity for you to live with him forever. He doesn't want you to suffer for your sins because he already suffered for him. What a waste for him to suffer for all your sins and you to suffer as well. He's appealing to you today friends to say, Lord, I want to accept what you've done in my behalf and live for you and he'll put you at his right hand where there are pleasures forevermore, is that your desire friends? He's calling you today to come to the cross and accept that forgiveness, eternal life or perish. Those are our choices. Would you like to choose Jesus tonight friends? Those who are watching is that your prayer, let's ask him once again. Father in heaven, dear Lord we are so thankful that Jesus came and he suffered so intensely, he suffered for the misery and the guilt of all the sins in our lives All the sins we ever have committed or could commit all of all of humanity and we can't comprehend that. We're poured upon Jesus and Lord we accept what he has done on our behalf. We want to embrace it and then I pray that we'll be transformed by your love help us to be new creatures now, that we might have our new bodies when Jesus comes and live in that new earth. Lord, I pray you'll work miracles in the lives of each person who is listening and watching now. Help them to embrace the truth and be liberated by the truth because Jesus is the truth and it's in His name we pray, Amen. Narrator: What does it mean to be a Christian? There are those who say, "Oh I'm a Christian. I'm just not a practicing Christian." What they're saying is that they've accepted Christ earlier in their life then figured out once they were saved they couldn't be lost. Is that what the Bible teaches, does it matter if we practice the teachings of Christ or not, is it true that once you're saved you can't be lost? What is predestination, what does it really mean to follow Jesus. We have a special book that tackles all of these issues called, can a saved man choose to be lost? To get your free copy visit amazingfacts.org or call 877-301-54-44 and ask for offer number 112. Once you've read this resource feel free to share it with a friend. We want to get the word out because God's message is our mission. Doug Batchelor : Hello friends, this is Pastor Doug Batchelor with Amazing Facts every Sunday evening 7:00 PM Pacific time. I host an international interactive Bible study called Bible answers live, where I take your questions about God's Word live right over the air and help you find a biblical trustworthy answer. If you need some answers regarding a challenging verse of scripture I hope you'll plan on joining me. If you want more information go to www.amazingfacts.org to find out where you can listen to Bible answers live in your area. Narrator: Throughout recorded history, tales of ghosts and spirits can be found in folklore in nearly every country and culture. Egyptians built pyramids to help guide the spirits of their leaders. Rome sanctioned holidays to honor and appease the spirits of their dead. Even the Bible tells of a king that used a witch to contact the spirit of a deceased prophet. Today ancient folklore of spirits and apparitions have gone from mere superstitions to mainstream entertainment and reality. Scientific organizations investigate stories of hauntings and sightings trying to prove once and for all the existence of ghosts. Even with all the newfound technology and centuries of stories all over the world, there is still no clear-cut answer. How do we know what's true? Why do these stories persist? Does it even matter? We invite you to look inside and find out for yourself. Visit deathtruth.com. We hope you enjoyed and were blessed by this broadcast of wonders in the word. If you'd like to hear or even watch more of Pastor Doug's presentations visit amazingfacts.org for a list of programs, times and stations in your area and how you can watch online. That's amazingfacts.org and until next time. May the Lord bless you as you discover more wonders in the word.